The waste plastic to oil conversion technology is also called palstic pyrolysis technology, by which we can get the plastic oil and carbon black. 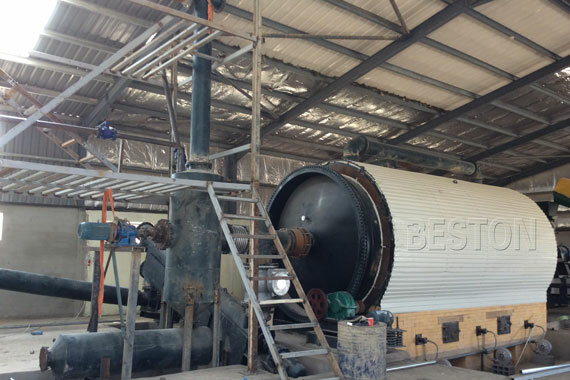 These two kinds of pyrolysis products can be applied to different fields. The plastic oil can not only be directly used as fuel oil in industries such as steel and iron factories, ceramics, power or chemical industries etc., but also can be refined to diesel. If further refined to diesel, it will have higher economic value and have more applications. The carbon black can be used for making construction bricks with clay or used as fuel. The pyrolysis technology can be applied into various kinds of plastics. For different plastic materials, we often get different oil ouput yield. Polyvinyl chloride PVC, polyethylene: PE (such as films, bottles, electrical insulating materials, handbags, pipes, drums, bottles / calcium bottles, daily necessities, etc. ): pure plastic has oil yield is about 95%. Polypropylene: PP (such as films, plastic rope, tableware, pots, barrels, furniture, bags, caps, car bumpers, etc. ): pure oil yield 90%. PS (such as electrical appliances, stationery, cups, food containers, appliance housings, electrical fittings, foam products, toys, etc. ): pure oil yield at 90%. Pure white plastic sheeting: about 70%. To improve the average oil output and help users get more profits, we have developed two special methods. On one hand, we adopt tubular condenser which has larger cooling area and better cooling effect. On the other hand, we use unique catalyst which is made from 24 chemicals. So, the oil yield can be increased by 5%. 1. The reactor is 360-degree rotating. This special design makes the bottom of reactor heat evenly, which lengthens the service life of reactor as well as improves the pyrolysis efficiency. 2. By the extra gas recycling system, the gas can be recycled to heat the reactor as fuel, which reduces pollution and save energy. 3. In the dedusting system, three steps are used to dedust the hot smoke from reactor, more than 95% of the dust would be removed. The released gas is pollution-free and can be discharged in the air directly. 4. It is also equipped with safety device (alarm for over temperature and pressure, auto pressure releasing system, extra gas recycling system, fire fighting devices), which will guarantee safety in production process. We also provide the excellent services:(1)Machinery installation and worker training, till you can run the factory smoothly. (2)12 months guarantee period. (3)Regular phone call visiting and technology updating. (4)Free catalyst offering for one month’s running. (5)Free wear parts offering for one month’s running.